Staying in cycling shape over the cold winter months can be difficult. Fat bikes are a great way to maintain muscle and form, but winter provides some amazing opportunities to branch out and do some cross training. Challenge yourself this winter by trying a different sport. You will work different muscle groups, keep up your cardio base and experience the great Canadian wilderness in a whole new way. 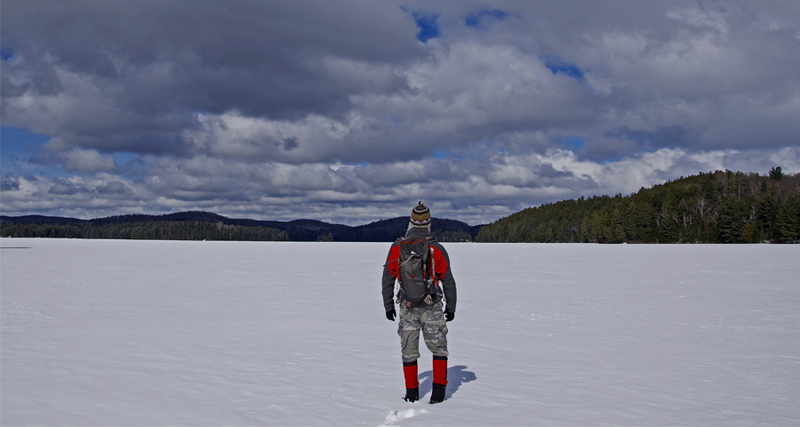 Modern snowshoes allow for easy access to remote areas that are otherwise difficult to experience. Even if you are familiar with a hiking or cycling trails in summer, a blanket of snow makes for a new and magical experience. With snowshoes it is possible to explore side trails and areas that might be impassable in summer. Working through fresh snow provides a more challenging workout than regular hiking but still provides a similar closeness with nature. Snowshoes also muffle the sound of footsteps and can lead to more frequent wildlife sightings. For the most serious of adventurers, open fields or wide trails provide the opportunity to run on the new breed of smaller and lighter snowshoes, which is a challenging and refreshing alternative to icy winter roads or basement treadmills. 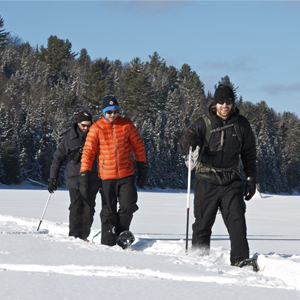 Provincial Parks such as Arrowhead and Algonquin provide many kilometres of snowshoe trails, but most trails you can hike in summer provide the perfect location for snowshoeing. 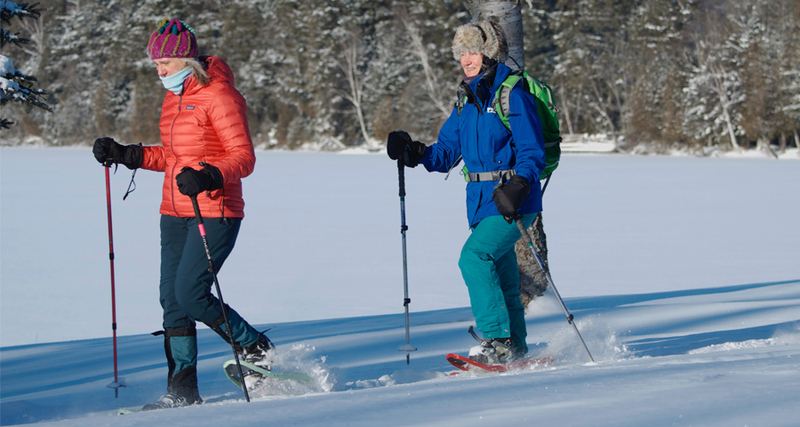 The Discovery Routes Organization has listings for multiple trails in the Almaguin Highlands that are suitable for snowshoeing. Try combining a snowshoe trip with star watching by donning a headlamp and exploring the Torrance Barrens Dark-Sky Preserve outside the town of Gravenhurst. Other notable locations to explore include Ragged Falls outside the Village of Dwight, the Georgian Nordic Outdoor Activity Centre in Parry Sound and Killbear Provincial Park which is officially closed for winter but allows access for snowshoeing and skiing. Cross country or Nordic skiing provides one of the best aerobic, full body workouts you will find. Skis allow for a faster pace of travel while still allowing you to enjoy the pristine beauty of a snow-covered landscape. Classic skiing is the place to start for new skiers. Track set trails mean you can concentrate on your form and pace while your skis stay straight inside the tracks. Raising your head to watch for wildlife and enjoy the scenery is the name of the game when classic skiing. For a more advanced and challenging workout, head out on a pair of skate skis. Just like the name implies, skate skiing uses a groomed flat surface where forward momentum is created by pushing from one foot to the other just like you would on skates. Raising the difficulty engages more muscles similar to those used in cycling and greatly increases the aerobic difficulty – perfect for staying in shape for next season’s singletrack trails or asphalt hill sprint. There are many locations across the region that maintain a groomed selection of trails for classic and skate skiing. Arrowhead Provincial Park provides up to 33 km depending upon conditions, and Algonquin Provincial Park maintains 110 km of trails. 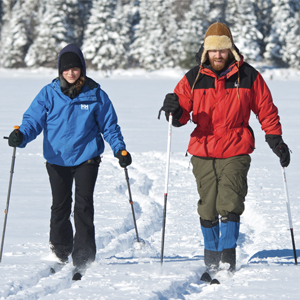 In Parry Sound, the Georgian Nordic Outdoor Activity Centre offers 30 km of groomed trails and the Bracebridge Resource Management Centre has 16 km of trails that are frequently groomed by dedicated volunteers. If packed trails are not your scene, consider renting and trying backcountry skis. These skis are significantly wider than traditional Nordic skis but use similar bindings. The wider shape allows skiers to float more easily in powder snow conditions, making it possible to blaze your own trail virtually anywhere. A relative newcomer on the outdoor adventure scene, skating trails combine the cardio and cross training benefits of traditional skating set against the backdrop of new and exciting outdoor venues. The trail that started it all, Arrowhead Provincial Park’s skating trail, officially opened in 2012. The 1.3 km loop is flooded daily and winds through the snow covered forest, complete with natural curves and elevation changes. For the ultimate skating trail experience, head to Arrowhead for Fire and Ice Night held select Saturday nights in January and February. The entire length of the trail is lit with torches, flickering flame reflecting off the ice and the trees for a nighttime skating experience like no other. Be sure to check the Park’s Daily Report for trail conditions and hours. Skates can be rented from the park’s newly opened Visitor Centre. Another skating trail option is the 1.2 km trail at Muskoka Lakes Farm and Winery. The loop wraps around the famous cranberry marsh and is also torch lit every Saturday night in January and February (weather permitting). There are also two pond hockey surfaces complete with boards and nets and a learn to skate surface built for skating aids and strollers. They also offer skate rentals on location. Be sure to enjoy a hot mulled wine or cran-apple cider to cap off your outdoor adventure. There are multiple options across Cottage Country for equipment rental. Algonquin Outfitters: The Oxtongue Lake location rents skis and snowshoes can be rented from either the Huntsville or Oxtongue location. Arrowhead Park: The newly opened Visitor Centre at Arrowhead Park rents skis, snowshoes and skates, plus it has a common area with a fire place for warming up after a long day. Georgian Nordic Outdoor Adventure Centre: The Burrow at Georgian Nordic has a selection of skis and snowshoes available for rent. They advise users to call ahead to check availability. Liv Outside: Located in Bracebridge, Liv Outside rents skis and snowshoes and has their own trail network accessible from the shop. Instead of hibernating or spinning indoors, make 2019 the winter you get in better shape and get outside! 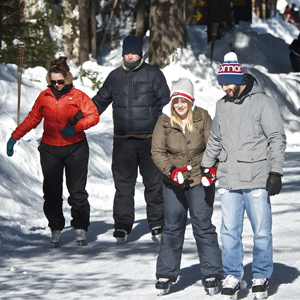 Snowshoe, ski or skate your way to better fitness and a new appreciation for the beauty of winter in Cottage Country. Bill Farnsworth is a freelance writer who has lived in Muskoka for more than 30 years. When not writing, Bill can be found cycling, running, paddling and trying to keep up with his two adventurous boys.